Structure Your New Life as a Working Dad in a Way That Advances Yourself as a Parent and a Professional. The Mindful Return Working Dad Course will teach you new skills as a father and show you opportunities to apply them to your job. Will you fall too far behind at work? How will the office react if you ask for additional flexibility? What if you want to take a longer paternity leave than a couple of weeks? Will you miss out on promotion opportunities because of outdated parental leave policies or culture? It doesn’t have to be this way. You don’t have to spend your already low energy reserves on worries about how you’ll succeed as a working dad. In fact, many of the lessons you’re learning in fatherhood can translate into opportunities and skills that’ll fuel your career. Mindful Return created a program unique to working dads. In this class, we help usher you, the working father, into a new rhythm of life. It’s this rhythm that’ll teach you valuable lessons about how to manage a household and a team at work, how to optimize your time, and how to be proactive and productive. This program is specifically for career-driven, enthusiastic new dads. Sound like you? We’d love to have you on board. We’ll show you how to use your go-getter attitude to bravely balance time with your growing family and in the office. Mindful Return digs deep and gives you powerful insights into life as a working dad. But there’s more to it than modules and worksheets. In the Mindful Return Working Dad Course, you get access to an expert-level curriculum, while also becoming a part of a powerful peer mentoring community. Yes, there’s step-by-step guidance. But there’s also a group of other working dads to lean on whenever you need help or support at work or at home. Mindful Return was created by working parents, Jeremy Smith and Lori Mihalich-Levin. 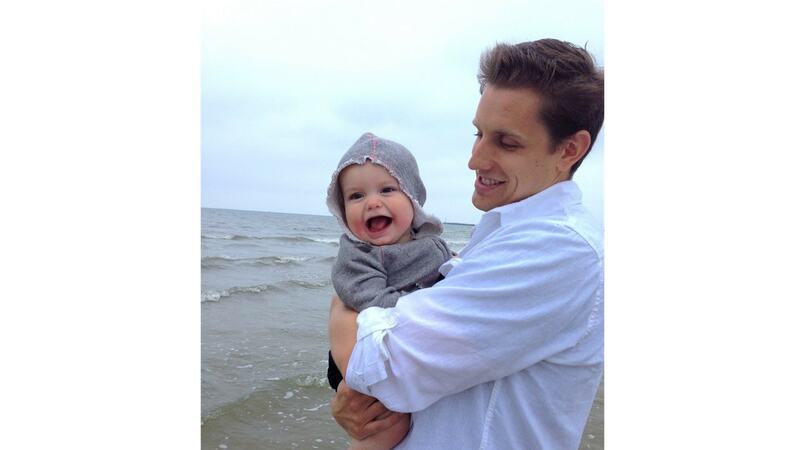 Jeremy is the creator of Paternity Leave Pioneer and works in corporate finance. He joined forces with Lori, a lawyer with two young children of her own and creator of the Mindful Return Maternity Leave Course, to create a program specifically for working dads. Using their collective insight, they created this course to offer support and encouragement to other working parents. There’s an obvious gap in the workplace today – the gap between home life and life in the office. To help bridge that gap, especially in the transformative early days of a newborn’s life, Mindful Return has designed a curriculum that offers step-by-step guidance for balancing the new demands in your life. As a bonus, there is even course material on structuring parental leave and returning to the office in a better position than when you left. Plus, you’ll hear from others who are walking this same journey – people you can lean on whenever a question arises. Are you starting to consider what your new life as a working dad will look like? Perhaps you’re thinking about whether to take a paternity leave, or how long to take? Or perhaps you’re already in the trenches of new fatherhood wondering how you’ll navigate the murky waters ahead both personally and professionally? Mindful Return will help you focus on your baby and family, while navigating the transition into working fatherhood. Get support from a community of other working dads who are entering work at the same time as you. As my wife’s pregnancy progressed, I started to worry about whether I would be able to take time off, how much time would be acceptable, and how I would approach “the talk” with my colleagues and supervisor. Even though the law firm I work for has a generous parental policy applying equally to moms and dads, I was nervous about what my colleagues would think if I took “too much” leave, and how it could potentially affect my career. This is when I took the Mindful Return Course with Jeremy (my coach) and with many other dads. I quickly realized that I was not the only one asking myself these questions. Even though most new or future dads want to take time off and support their spouse equally and bond with the newborn, most of us also struggle with the idea that we are somehow failing our employer and our colleagues. Through a step-by-step approach and online group sessions, Mindful Return made the process infinitely easier for me. It also helped me prepare for the talk with my supervisor, who ended up being incredibly supportive! Mindful Return costs about what you’d pay for a 90-minute massage or an hour with a therapist. For $199/person, you will be left feeling confident and set up for success – feelings money simply cannot buy. Some employers offer Mindful Return as a benefit. Ask your employer to cover the cost! Many do. Indefinite access to (1) all the course materials, and (2) a private Facebook group filled with other dads who are easing into their role as a working father at the same time you are. A $25 coupon for your partner to sign up for any of our Mindful Return courses, including our popular course for working moms or this one, for working dads. Or, use it for a friend and buy a second Mindful Return course at a discount to give as a baby gift. Know you’d benefit from this course but have financial hardship? Contact Jeremy at Jeremy@MindfulReturn.com or Lori at Lori@MindfulReturn.com to discuss assistance options. What is the “Mindful Return Working Dad Course”? “Mindful Return” is a four-week, online course. (A three-week session to take when baby arrives, plus one take-it-anytime “bonus week” to help you prepare for your leave.) The mom version was born from the lessons Lori learned learned returning to a full-time job twice after maternity leave. The dad version was developed based on Jeremy’s experience with two paternity leaves and his own transition to working fatherhood. He discovered a lack of good information for new dads on what it’s really like to take paternity leave, and how to transition smoothly back to work. This course will empower you to plan a thoughtful, peaceful, and successful paternity leave and will connect you with other new working dads who are going through this life transition at the same time you are. When should I take this course? Before baby arrives? On leave? After baby is born? The one-week Bonus part of this course is designed to be taken before baby arrives. This week-long Bonus module is all about how to tactically approach and set up your leave. No need to take this part, though, if your baby has already arrived. The main part of this course is a three-week session that starts on a specific date, which you should take at any point after baby arrives. If you’ll be on an extended paternity leave, great – you can take the course while you’re out on leave. If not, take it anytime you’re looking to get your bearings in working fatherhood. Anytime is a great time to dive in. The course serves two functions: 1) Help dads prepare for life with baby, and 2) Help dads who are already back at work to keep their heads above water. When in doubt, sign up for the earliest session you think makes sense, and you may always take a later session at no additional cost. If you are considering leave, learning and getting ready now will help you plan ahead and give you a support network to make everything less daunting. If you are already on paternity leave – but perhaps trying to avoid thinking about going back – now is the time to get some reassurance that you can do this in an effective way. And if you’re already back, you could probably use some extra positive voices helping you get through the day. This course is for all of you. What if I’ve already read my company’s paternity leave guide? Will I still get anything out of the course? Yes! This course goes far beyond the nuts and bolts of taking paternity leave. We aren’t just focused on making the decision to take leave or how to facilitate it. While those are important aspects we cover, the course is designed to help you step up and become the father and professional you know you can be. This course provides specific tactics for setting up and returning from leave, so that you can ensure your career continues on an upward path, helping to provide for your growing family. It also digs into optimizing your leave, adjusting to fatherhood, providing real support for your partner, and using your leave as an opportunity to improve leadership and advance your career. Key features of the online course are: (1) guest lessons from experts in the fields of parenting, family dynamics, meditation, and mindfulness; (2) writing and discussion prompts at the end of each lesson, to encourage you to dig deep into the material; and (3) the amazingly supportive community of other new working dads whom you will meet during the course. Does it matter how long my paternity leave is/was (or even if I took one)? No. The lessons in this course will be helpful, whether you took off 2 days, 2 weeks, 2 months, or a year. This isn’t my first child. Will I still get anything out of this course? Once the course starts, our recommendation is that you spend about 15-30 minutes a day reviewing the course material and answering the prompts. You can easily spend more time reading your fellow dads responses and responding to their comments, but about 20 minutes will ground you in the material. That said, this course is for you – to do at your own pace, and work as you are able. The more you put into the course, the more you get out. You can login any time of day to read the lessons and see what other dads are talking about. And yes, the private and secure online platform we use for the course (Ruzuku) is accessible via mobile devices. Whether you log in during your commute at the beginning of the day, while your newborn is napping, or while you’re feeding your little one in a rocking chair at 3 a.m., chances are, another dad will be following along with you, posting comments at the same time. Who is the author of the course content? Jeremy Smith, father of two, and creator of Paternity Leave Pioneer, penned the majority of the course and serves as moderator throughout. He has successfully taken two paternity leaves during his time at work in the financial services industry, where he continues today. His course design is modeled after the maternity leave course Lori Mihalich-Levin created, which has helped hundreds of moms since 2015. You will also have the great opportunity throughout the course to hear from some fantastic guest teachers, who bring decades of expertise. Robin S. Smith, MS, LCMFT, is a Licensed Marriage and Family Therapist and primary contributor to Your Couples Therapist Blog. Hey, we get it. We’re working parents too and know how chaotic things can get. That’s why we designed this course, so that it’s never a problem if you fall behind. Just pick up where you left off and go at your own pace. Pro tip: The weekends are good times to get caught up because there are no new lessons on weekends. Yes! You will have indefinite access to the course material, on the course’s private Ruzuku page. There will also be an opportunity to stay in touch with your fellow returning dads after the course is over. Joining one of the scheduled sessions of the 3-week (+ 1 bonus week! ), 20-lesson course costs $199. All major credit cards are accepted for payment through the Ruzuku course website using Stripe (like PayPal, only easier to use!). Do you have a question that wasn’t answered here? E-mail Jeremy directly at Jeremy@MindfulReturn.com. The transition into fatherhood isn’t easy. With the expert curriculum uniquely paired with support from a peer group filled with other men walking this same path at the same time you are, you’ll feel empowered and ready to take the world by storm.